The first-quarter of the baseball season has not unfolded the way the Los Angeles Dodgers envisioned. Before Thursday’s win over the Marlins, Los Angeles had lost six straight games and dropped to 10 games under .500. It was the first time the Dodgers were 10 under .500 since 1929. They even dipped, albeit temporarily, below the Padres for last in the NL West. 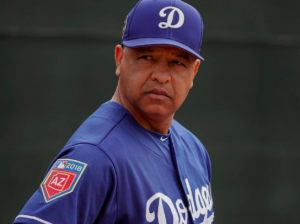 However, the Dodgers brass has let it be known that they are not panicking or placing the blame on manager Dave Roberts. Blaming Roberts at this point would be quite unfair. The Dodgers have been inundated with injuries to some of their most prominent players. All-star shortstop Corey Seager has been lost for the season due to Tommy John surgery. Justin Turner only recently returned from the DL after missing the early part of the season. Logan Forsythe also missed a month due to injury. The Los Angeles pitching staff has not been immune from the injury bug either. Ace Clayton Kershaw went to the DL earlier this month and is yet to return. Fellow lefty Hyun-Jin Ryu is expected to be out until the all-star break. Rich Hill has also missed time due to blister issues and hasn’t been that effective when he has been able to pitch. On top of the injuries, many of the players who have managed to stay healthy this season have underperformed, especially during the recent six-game losing streak. To be fair, Yasmani Grandal and Matt Kemp have been surprisingly productive. But Chris Taylor, Yasiel Puig, Joc Pederson, Chase Utley, and others have failed to perform up to the same level as past years. Roberts has consistently said this season that he’s not disappointed in the effort of his team. However, that has only made the recent losing streak all the more frustrating. While Roberts and the Dodgers search for answers, it should be reassuring for the manager to have the support of the Dodgers front office. Of course, while it’s nice for Roberts to get a vote of confidence, the Dodgers still have a steep hill to climb. They are still eight games out of first place with three teams ahead of them in the NL West standings. With Seager lost for the season and Kershaw still on the DL, the Dodgers digging themselves out of the hole they’ve dug will be easier said than done.